...the first oriental in the Lalique portfolio with a fresh top, including notes of bay leaf, pink peppercorn and bergamot, over a floral heart of jasmine and heliotrope and a woody base comprising vanilla, patchouli, tonka bean and sandalwood. 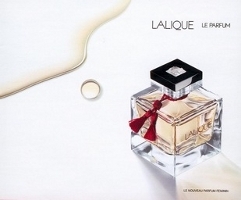 Update: Lalique Le Parfum is available in 30 ml Parfum, 50 or 100 ml Eau de Parfum. Oh, this is interesting! Dominique Ropion is everywhere these days, no? I really liked Le Baiser, by Anne Flipo for Lalique. I have not tried many others, but the bottles are very pretty. It is because I confused Tender Kiss with Le Baiser. Le Baiser is indeed Laurent Bruyere's creation. Sorry for this. These perfume companies need to stop coming up with variations on variations, although I do like Tender Kiss's lilac bottle. Thanks V. And a more unique name for this new one wouldn't hurt, since there is already an Eau de Lalique.